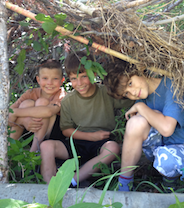 Build a fort, go day camping, discover hidden caves, and learn about what it takes to survive in the wilderness. Ever start a fire with flint and steel? How about a bow-drill? Our staff can teach you. At Ajax Sleepaway, we have partnered with Aspen Center for Environmental Studies (ACES) to offer one week of more in depth survival sleepaway camp filled with optional activities ranging from animal tracking to shelter building. Check out the sleepaway camp page to learn more.